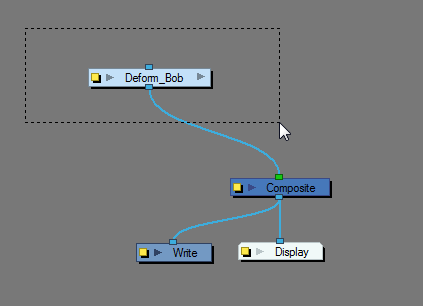 You can change the display style of selected elements to Bounding Box. This will remove the normal selection coloured highlight and leave only the bounding box around your selected element. 1. Select View > Show > BBox Selection Style. When you have several layers in your Timeline view, you may find it hard to locate which one is selected. 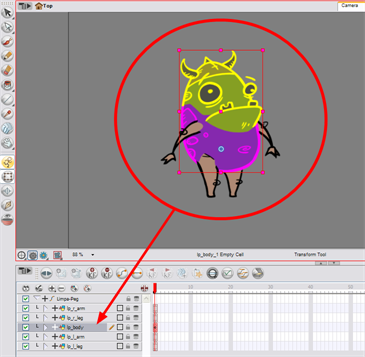 Toon Boom Harmony has an easy solution to this problem, you can use the Centre on Selection feature to display the selected layer in the Timeline view. 1. In the Camera view, select the desired layer. 2. Make the Timeline view the current active view. 3. From the Timeline menu, select View > Centre on Selection or press [O]. 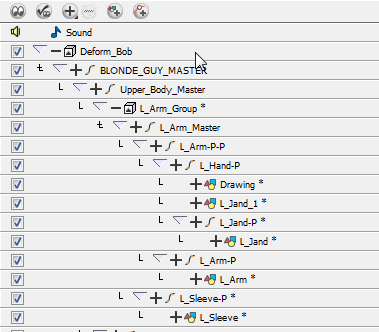 If your selected layer is in a group, or a child of one or more elements, continue to press [O] to expand the layers in the Timeline until your selected layer becomes visible. 4. You can also click the Centre On on Selection button in the Timeline View toolbar. Refer to the Managing the Toolbars to find out more about customizing the toolbars. Just as with the Timeline view and the many layers contained in it, when you have several modules in the Network view, you may find it hard to locate which one is selected. You can also use the Centre on Selection feature to focus on the selected module in the Network view. 1. In the Camera or Timeline view, select the desired layer. 2. Enable the focus in the Network view. 3. In the Network View menu, select View > Centre on Selection. You can also press the Centre On Selection button available in the Network View toolbar’s extra button or press [O]. You can also select your elements from the Timeline or Xsheet view. This can be useful when there are too many objects in the scene or when an object is hard to grab. The selected element will be highlighted in the Camera view. There is an easy way to select all the elements within a group at the same time. You can do this via the Network or the Timeline view. 1. In the Network view, navigate to the group you would like to completely select. 2. Hold down and click-drag a marquee selection around the group module. 3. All elements within that group will now be selected. 1. 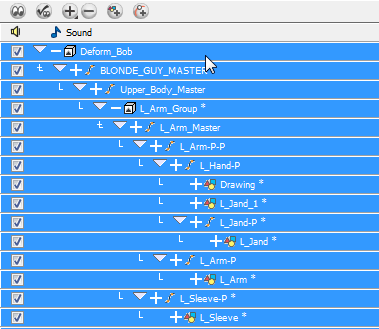 With a group collapsed or expanded, hold down [Alt] and click on the group in the Timeline view. 2. All elements contained within the specified group will be selected.